I love Valentine's Day. Baking, flowers, all things pink—it's just such a fun holiday! However, I do know how difficult it can be to shop for your girlfriend, mom, or even your best friend. My boyfriend keeps asking me what I want for Valentine's Day. We're doing Valentine's Day the 17th instead of the 14th anyways because 1. I have classes from 12-8 at night that day and 2. we got tickets to see Brad Paisley on the 17th so we just decided that would be our Valentine's Day. 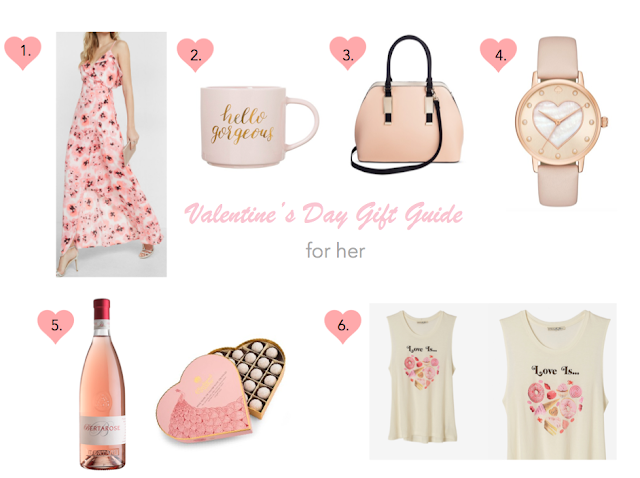 I keep telling him I don't want anything major, but he insists, which led me to making a Valentine's Day gift guide for the ladies. Hopefully this makes your holiday shopping a little easier!